Most Australian adults will experience low back pain at some time in their lives. Most low back pain gets better without the need to see a doctor, and gentle activity, not bed rest, seems usually to be the best treatment. Low back pain (lumbar pain) can be caused by a problem in the muscles, ligaments, discs, joints or nerves of the spine. Some back pain is due to serious problems, but most back problems are ‘mechanical’ in nature and can be prevented by looking after your back and keeping it in good shape. Weakness of the leg or foot. Sometimes back pain is more on one side of the spine than the other. New bowel or bladder problems, such as not being able to urinate or incontinence. Numbness over the buttocks, especially in a pattern like a saddle. A recent fall or injury to the back. Back pain that is worse when you are resting, lying down or in bed at night. Weakness in a leg, which might show itself as dragging a foot or one leg. Also, if you are over 50 or under 16 and have back pain you should see your doctor. Similarly, if you have ever had cancer or suffer from osteoporosis, or the back pain is accompanied by unexplained weight loss, you should seek medical advice. Did the back pain come on suddenly, does it come and go, or has it gradually worsened over time? Is your back sore to the touch? Is your back pain affected by your position, e.g. is it worse or better when you stand or sit, or bend over or lie down? Was it brought on by exercise or activity that you are unaccustomed to? Do you have any pain in your feet or legs? Is there any tingling in your legs or feet? Is the back pain accompanied by any swelling? Is the pain worse during the night? Are you having any problems going to the toilet? Your doctor will examine your back and may wish to feel and locate any areas of sensitivity and pain. They may ask you to perform movements so they can see your range of motion. They may also test the nerves. These examinations will not usually reveal the exact cause of the back pain, but they help your doctor to rule out any serious problems or problems needing immediate attention. In many cases, knowing the exact cause of the pain does not change the recommendations for treatment. Most non-specific back pain or uncomplicated back pain does not need a precise diagnosis of the anatomical problems that are causing it before treatment is started. X-rays or other radiological imaging tests are not usually recommended initially for low back pain as the findings do not necessarily correspond with the severity of symptoms. For example, many adults have signs of damage (such as to discs or facet joints) on X-ray, but have no symptoms of back pain. And conversely, many people with low back pain will have no obvious signs of damage on X-rays. If the back pain has been ongoing, or your doctor suspects a fracture or specific cause, they may suggest you have some imaging tests. Sometimes, your doctor may wish to order blood tests to rule out or confirm causes such as infection, inflammation or cancer. If your doctor suspects a specific cause of the back pain then they may refer you for imaging tests such as X-ray of the lumbar spine (although plain X-rays are rarely useful), or an MRI scan. MRI scans can show the spinal discs and the nerve roots and the soft tissues. MRIs are probably the most useful imaging technique for low back pain as they can show problems with the discs and whether anything is pressing on the nerves of the spinal cord. Sometimes a CT scan will be suggested, if an MRI is not available. Ultrasound may be used if kidney stones are suspected as the cause of the pain. Nerve conduction studies called electromyography may be suggested, however the results often don’t reflect the symptoms, so this test may not give any useful information. Should I see a specialist for low back pain? Depending on the results of tests, your doctor may refer you to a specialist, however, 99 per cent of low back pain that GPs see is not serious. Specialists that treat low back pain include pain specialists, neurosurgeons, rheumatologists and orthopaedic surgeons. In addition to doctors, many people find consulting with a physiotherapist or osteopath may help. Osteopaths and physiotherapists may help with diagnosis of some back problems, mobility, exercises, stretching and advice. Osteopaths and physiotherapists don’t require you to have a referral from your GP. Their services are only rebated on Medicare as part of a specific chronic disease plan, but may be covered by private health insurance extras cover. Most backaches are due to problems with the muscles, ligaments and joints. More serious problems occur when the nerves or spinal cord are injured, usually by local pressure. Low back pain can be due to a pulled or torn muscle in the lumbar region. There are many muscles involved in the lower back, which help support the spine and the upper body. These include extensor muscles (such as the erector spinae), the oblique muscles and the flexors (such as the psoas). When any of these muscles are stretched or torn (strained), there are micro-tears in the muscle fibres and these tears give rise to inflammation and pain. Myofascial pain like this from the muscles around the spine usually resolves after a short period of active recovery. But, it can also be present alongside other causes of back pain. A lumbar sprain happens when the ligaments of the lower back are stretched or torn. Ligaments are the tough connective tissue that joins bones, joints and cartilage together and keeps them stable. If the ligaments are stretched too far they can tear. The symptoms and treatment of a lumbar sprain are the same as for lumbar strain - which affects the muscles, rather than the ligaments. You won’t usually know whether your low back pain is a result of a muscle problem or a ligament problem. Both can cause quite severe pain and cause inflammation in the surrounding area and sometimes spasm of the surrounding muscles. A back spasm is felt as a cramping or tightening of the muscles. Spasms are involuntary contractions of the muscle - that means you have no control over them. Muscle spasms are usually caused by the back trying to protect itself from damage to the muscles themselves or may indicate that there is an underlying injury to the spine itself. Degenerative disc disease refers to normal changes to the spinal discs caused by ageing. 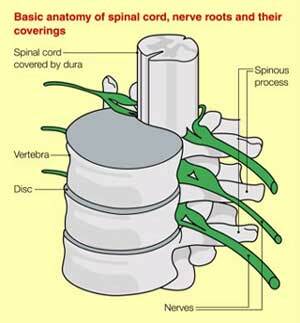 The intervertebral discs are cushion-like structures between the vertebrae - the bony joints of the spine. The discs have a tough outside casing and are filled with a gel-like centre. They act like shock absorbers. As we age the discs become stiffer, drier and thinner. This makes them less flexible and supple and they may restrict movement and cause pain. Degenerative changes are more frequent in the lumbar (lower) spine and the cervical (neck) region of the spine. Degenerative disc disease of the spine may cause chronic (ongoing) low back pain, interspersed with more painful flare-ups from time to time. The pain is often worse when sitting, as the back is carrying more load in that position, and the pain may be relieved by standing up, changing positions or lying down. With ageing, bone spurs - tiny growths on the edges of the bones of the spine - may also occur. These bone spurs (osteophytes) are usually smooth and may not cause any pain. Sometimes called a ‘slipped disc’, a herniated disc happens when the soft jelly-like centre of a spinal disc bulges out of a tear in the outer casing of the disc. The disc itself doesn’t move, but a split in its casing allows the soft middle (nucleus pulposus) to bulge out (herniate). Herniated discs don’t always cause problems - up to a third of people who don’t have back pain are shown to have herniated discs on imaging. However, sometimes the bulging part can press on a nerve and cause pain, tingling and other problems, such as weakness. Inflammation from the site may also contribute to symptoms. Prolapsed discs like this can be the cause of sciatica. The discs in the lumbar spine are most likely to herniate - these are the discs between the 5 lumbar vertebrae - L1 to L5. Over time, the herniated portion of the disc (that’s the part that’s bulging out) usually gets smaller (regresses) and the symptoms ease and may go away. Most people with symptoms will improve in 2 weeks. Facet joint problems are common causes of back pain and the resulting condition is commonly referred to as facet joint pain or facet joint syndrome. The facet joints are small stabilising joints between and behind the vertebrae of the spine. There are 2 facet joints between each 2 vertebrae at every level of the spine (except the very top vertebrae in the neck). They allow some flexibility so that you can slightly twist and turn around, but they give you stability so that there isn’t excessive movement in your spine. The facet joints in the lumbar region allow only flexion and extension, so no twisting. Facet joints are synovial joints, so the joint surfaces have cartilage to allow them to glide smoothly together and they are enclosed in a lubricant-filled capsule. Over time, facet joints can wear out, and with wear and tear the cartilage can become thin, leading to the bones rubbing on each other. This osteoarthritis leads to inflammation and pain, and bone spurs can form on the surface of the bone. As the intervertebral discs become thinner with age, more pressure still is put on the facet joints. Facet joints can also slip (dislocate) and become locked in position. Locked facet joints happen suddenly, for example when a person bends down to tie a shoelace and then experiences that their back seizes up. Problems with facet joints can be unpredictable. Symptoms of facet joint problems include tenderness over the affected facet joint, decreased movement and stiffness, pain when bending backwards and pain in the buttock or radiating down thigh (but not beyond knee). Narrowing and impingement of the nerve root after it has exited the vertebrae. Spinal stenosis can be caused by degeneration of other structures in the back, such as the facet joints or discs, for example by bone spurs or herniated discs. Some people inherit a small spinal canal in the first place. Symptoms of spinal stenosis often start slowly and worsen over time. They may include tingling, numbness or weakness in the feet or legs. If you have symptoms like these, you must visit a doctor. Ankylosing spondylitis is a type of arthritis affecting the spine. The cause is not known, but there is a strong inherited component to the disease. The symptoms of ankylosing spondylitis are lower back pain and stiffness (especially first thing in the morning), tiredness and pain over the buttocks and down the thigh. The pain tends to ease as the day goes on. Rest does not help back pain from ankylosing spondylitis. Ankylosing spondylitis also causes pain and arthritis in other joints of the body, other than the spine. Spondylolisthesis is when one of your vertebrae slips forwards or backwards out of its normal alignment, causing a step in the building blocks of the spine. It most commonly affects one of the lumbar vertebrae in the lower back. It doesn’t always cause pain, but when it does the pain is usually worse during activity and relieved by lying down. If the slipped vertebra presses on a nerve, then you may have symptoms of sciatica - tingling down your leg and over your buttock. People with spondylolisthesis often have tight hamstrings. Spondylolisthesis may be due to a fracture or a defect that is inherited. It may be caused by a traumatic injury, such as from high-impact sports (e.g. gymnastics) or a motor vehicle accident. If the spine has become worn and arthritic, then spondylolisthesis is more likely. Problems with the sacro-iliac joints - the 2 joints that join your sacrum (tailbone) to your pelvis - can give rise to low back pain. You have a sacroiliac joint on the left and one on the right of your sacrum (the triangular shaped bone at the base of your spine). The sacro-iliac joints are designed to be fairly stiff, and don’t normally allow more than a few degrees of movement. They function as shock absorbers. If the joints are abnormally mobile (too much movement) or restricted in movement they can give rise to low back pain. The SI joints may also become inflamed (called sacroiliitis). Symptoms of sacro-iliac joint pain include low back pain, leg pain (but rarely below the knee), pain in the sacro-iliac region itself or in the buttocks. There may be muscle spasms of surrounding muscles as they try to protect themselves or respond to underlying damage. Cauda equina syndrome is a medical emergency caused by compression of the spinal nerve roots. Below the waist near where the lumbar spine starts, your spinal cord separates into a bundle of nerves and nerve roots that resemble a horse’s tail; this is the cauda equina. These nerve roots supply messages to your legs, feet and pelvic organs. Anything that compromises the nerves can affect the function of your bladder, bowel, legs and feet and could result in paralysis or loss of continence. If you develop any of these symptoms, you should visit a doctor or the emergency department straightaway. CES can be caused by a severe rupture of a lumbar disc, spinal stenosis, spine injury, inflammation or a birth defect. Osteoporosis - a condition causing spongy bones - can cause sudden compression fractures (cracks) of the vertebrae. These osteoporotic compression fractures usually affect the vertebrae of the thoracic (upper) spine, but may also affect the lumbar (lower) vertebrae. They cause sudden back pain when they happen and can lead to ongoing pain, pain that is worse when standing or walking, and loss of height. Vertebral fractures such as this are common in postmenopausal women and older men. Spinal fractures may also be due to trauma, falls, sports injuries, or motor vehicle accidents. Spondylolysis is a type of fracture or stress fracture in the vertebrae. It often affects young athletes who do sports such as gymnastics or football. Whilst the fractures sometimes spontaneously heal, they may not heal correctly and can cause ongoing back pain. Mostly there are no symptoms in young people with spondylolysis, but symptoms can include lower back pain which may extend into the buttocks or legs. Spondylolysis is a common cause of spondylolisthesis (mentioned earlier) where one vertebra slips out of position over another. Conversely, in older people with spondylolisthesis, this can lead to uneven loading of the facet joint, causing a compression fracture. Cancer is a rare cause of back pain. Tumours affecting the spine are usually secondary cancers that have spread from the primary tumour somewhere else in the body. Symptoms of spinal tumours include back pain, unexplained weight loss, weakness or numbness in arms or legs, and pain that is worse at night and which doesn’t go away with rest. Being overweight or obese - which puts more strain on the back. Being middle aged or older - back pain is more common the older you get. Lack of exercise - which can lead to weak back muscles that don’t support the spine. Poor posture - this can lead to muscle imbalances. Heavy physical work and lifting weights that are too heavy. Incorrect lifting technique, e.g. using your back instead of your legs. Overdoing it or doing unaccustomed exercise. Stress - this can lead you to unconsciously tighten your back muscles. Scoliosis - an abnormal curving of the spine sideways. Most uncomplicated back pain resolves after a period of active recovery and people are generally back to normal within 4 weeks. The pain is getting worse as time goes on. Active recovery includes trying to do normal activities as much as possible and keeping active. Gentle walking, which improves blood flow and speeds up healing, can help. Doctors now know that inactivity and rest will lead to stiffness and more pain and is more likely to lead to ongoing back problems. Careful stretching may help relax muscles, especially if you have muscle spasms. You may find that sleeping with a pillow between your legs can make night-times more comfortable. Over-the-counter painkillers such as paracetamol or anti-inflammatories, e.g. ibuprofen (Nurofen), may help ease pain and reduce inflammation. If they are suitable for you, anti-inflammatories may be more effective than paracetamol. The pain probably won’t be completely eliminated, but this should enable you to resume gentle activity. Make sure you take the recommended dose. These medicines are not suitable for everyone, so always check with your doctor or pharmacist. Topical pain relievers are applied to the skin at the site of the pain. They are creams or ointments, usually. Some use the same ingredients that are in the tablet forms of over the counter pain relievers, such as ibuprofen or aspirin. Others have ingredients such as capsaicin, a compound from chilli peppers, or menthol. Stronger painkillers. Depending on the circumstances of your back pain, your doctor may prescribe other painkillers, antidepressants or other medicines.There is no evidence to support using muscle relaxants to treat low back pain. Oxycodone (prescribed as Endone or Oxycontin) is a strong painkiller belonging to the opioid group of medicines and is sometimes prescribed for back pain. Oxycodone can lead to addiction if used for long periods and also carries the risk of overdose. Whilst it may be effective in the short term for sudden onset of back pain, oxycodone is not recommended long term and there is no evidence for it being effective in the long term. Codeine is another strong painkiller, sometimes used in the short term for back pain. Codeine is another opioid and can also lead to addiction. Hot or cold packs may help with the pain as may sitting in a warm bath. Heat loosens tight muscles and increases blood flow, bringing more oxygen and nutrients to the area. Cold can help reduce pain and swelling. Cold is usually used in the beginning stages of an injury. Exercise programs - A physiotherapist or osteopath should be able to help you with an exercise programme to improve mobility, reduce pain, prevent further injury and help with recovery from back pain. Don’t worry too much or allow negative thoughts to run amok - the relationship between our thoughts and pain is complex. Worry and anxiety about back pain can make the pain worse. Acupuncture - there is no evidence to show that acupuncture has any effect in improving low back pain, however, it is unlikely to be harmful. TENS (transcutaneous electrical nerve stimulation) - this technique uses low voltage electrical current and is said to block pain signals. At the moment, there is no evidence to show TENS has any effect in helping low back pain. Therapeutic massage - The evidence to support the effectiveness of massage to help lower back pain is not very strong, but some people have found it offers relief. Spinal manipulation is definitely not recommended, though, as it may not be safe in some situations. Pilates - Studio training with experienced instructors can help with core stability and posture, and improve the health of your spine and muscle strength. Pilates training works on the deep support muscles of the spine and should help protect you from future episodes of back pain. Yoga - Yoga can help with flexibility and posture, and along with the breathing and meditation aspects yoga may help to relieve lower back pain and improve function of the spine. Some yoga positions are not safe for people with certain back conditions, so you should always let a yoga instructor know if you have back problems. Alexander technique - The Alexander technique helps you to recognise and correct poor postural habits which lead to tension and pain in the body. Teachers in the Alexander technique observe the way you move and then with gentle guidance help you to learn safer and more relaxed ways of moving your body. One-to-one lessons in the Alexander technique have been shown to have a beneficial effect on back pain and functioning in people with ongoing or recurrent low back pain, even 12 months after the lessons have finished. Anti-inflammatory diet - Some foods have been shown to contribute to inflammation in the body, which in turn might aggravate back pain. Processed foods are generally acknowledged to be pro-inflammatory (causing inflammation). On the other hand, some foods are known to have an anti-inflammatory effect or can help with pain relief. Some foods known to reduce inflammation are omega-3 fatty acids (found in fish), and antioxidants from colourful fruit and vegetables. Facet joint injections - Facet joint injections are corticosteroid injections. Australian guidelines now recommend that in most cases, facet joint injections are not helpful. They were done when a facet joint was suspected of causing the back pain. If the pain went away then this confirmed the diagnosis of facet joint disease or facet joint syndrome. Back surgery - In ongoing, non-specific back pain, there is no evidence that surgery helps. Surgery is usually only relevant for a minority of people with back pain, who have specific anatomical causes of their back pain, such as problems that cause pinching of a nerve. Techniques for back surgery are becoming less and less invasive, many being carried out using keyhole surgery. lumbar decompression, which removes structures that are pressing on a nerve root, by either microdiscectomy, where the protruding pieces of a herniated disc are removed under microscopic view; or laminectomy, a more open type of surgery, where the facet joints may be trimmed, as well as problems with discs resolved. Kyphoplasty - insertion of a balloon to expand a compressed vertebra, followed by injection of bone cement into the vertebra. These compression fractures are usually from osteoporosis. Vertebroplasty - injection of bone cement into a compressed vertebra. Most people who have an episode of non-specific low back pain improve quickly, and usually recover within 4 weeks. A positive outlook can help you recover more quickly. However, a minority of people will have ongoing problems - the risk of this happening increases with age. Older people are particularly at risk of having recurrent episodes of back pain. If you’ve hurt your back already, then prevention is probably the last thing on your mind. However, some people have further episodes of back pain after the initial episode has resolved, so it’s worth finding out what you can do to protect your back from further attacks of back pain. The back is at least risk of injury when it is in its neutral position. Anything that forces it to tilt can cause strains to the ligaments, and pain can result. Twisting when lifting is one common cause of low back pain. The way we lift, sit at our desks, operate machinery and do hundreds of minor tasks can all affect our backs. Trying to keep the back in a neutral position at all times will reduce the risk of backache. This is particularly important with tasks such as gardening and housework, which involve a lot of bending. Whenever possible, bend the knees and keep the back straight when doing things at ground level. Here are some things you can do to try to avoid back pain. Maintain good posture. Try to sit and stand with a ‘neutral spine’ (a physiotherapist or pilates instructor will be able to show you this). Use your legs to walk up hills (not your back) by staying upright and not bending forwards. Slow down if you have to, to maintain good posture. Sit with your knees slightly higher than your hips. Stay active. Low impact exercise, such as walking or swimming can strengthen the back muscles and the muscles of the core, which allows them to support the spine correctly. Regular exercise can help with strength and flexibility, ease pain and stiffness and protect bones. Back strengthening exercises. Try to do these every week at least a couple of times. A physiotherapist or pilates instructor will be able to help you with the best exercises for your back. Avoid heavy lifting. Avoid lifting weights that are too heavy for you. Learn correct lifting techniques - bend from the knees and use your legs to push up, and contract your abdominal muscles before you lift. Don’t twist when you lift, and don’t bend from the waist. Push, rather than pull, heavy objects. Pay attention to your carrying technique. Try not to load down one side of your body with heavy bags or handbags - distribute the load as evenly as possible and keep your shoulders square. Swap sides often when carrying heavy bags. Avoid stress. Being stressed or anxious leads to muscle tension by causing blood vessels to narrow, reducing blood flow and oxygen to the body’s tissues. This leads to a build-up of waste products, which cause the muscles to spasm or contract. Being under constant stress causes the muscles to tighten and shorten, causing pain - often in the neck and back. Stretching. Stretching can help to reduce muscle tension. Tight hamstrings - the muscles down the back of your thigh - can be a cause of low back pain, so make sure your hamstrings are stretched out and not too tight. Not smoking. Smoking is linked to the development of low back pain. Doctors think this is due to reduced blood flow (which reduces the nutrients reaching the back), jarring from coughing and the fact that the bones of smokers have a lower mineral content. Eat a healthy diet. Some foods have been shown to have anti-inflammatory or pain-reducing properties. An anti-inflammatory diet, such as the Mediterranean diet, may help keep inflammation at bay and so lessen your chance of back pain. Stay hydrated. As we age, the soft gel-like centre of our intervertebral discs dries out and the discs become less effective as shock absorbers. Staying hydrated may go some way to help keep the discs plumped up and slow down this process. Maintain a healthy weight. Being overweight can make it harder to move about and puts more strain on your body. Being overweight also creates inflammation in the body. Avoid high heels. High heels alter your body’s alignment and put a strain on your back. Unsupportive footwear, such as thongs or flipflops, do not support the arches of the feet and so can lead to poor posture and back pain. Therapeutic Guidelines. Low back pain. (Published March 2017). eTG March 2017 edition. Patient UK. Low back pain and sciatica. Reviewed Dec 2016. http://patient.info/doctor/low-back-pain-and-sciatica (accessed Feb 2017). Mayo Clinic. Back pain. Reviewed June 2015. http://www.mayoclinic.org/diseases-conditions/back-pain/basics/definition/con-20020797 (accessed Feb 2017). Chris G Maher, Chris Williams, Chris Lin, and Jane Latimer. Mayo Clinic. Herniated disk. http://www.mayoclinic.org/diseases-conditions/herniated-disk/home/ovc-20271246 (accessed Jun 2017). Mayo Clinic. Nutrition and pain. (Reviewed July 2016). http://www.mayoclinic.org/nutrition-and-pain/art-20208638.